I Heart My Glue Gun: Kitchen Reveal! It's TIIIIMMMMME! Today's the day that I finally get to reveal my beautiful, WONDERFUL KITCHEN! When we moved in this house December 2010, it needed work. BAD. Over the course of 14 months, we did a LOT of work. But NEVER touched the kitchen. The thought overwhelmed me: there was grease EMBEDDED into the cabinets. Broken corner tiles. Heck, broken TILES period. Broken drawers. It was bad. The good people at Giani Granite offered to help give us a beautiful kitchen by donating their Bombay Black Kit to us to make over our countertops- I am SO GLAD they did! This kit is AMAZING....just ABSOLUTELY AMAZING! It was so easy to do, and I LOVE the results! After repairing the broken tiles and giving our countertop a light sand, we applied the kit directly to the tile, and it ended up looking like granite tile! SWEET! On the cabinets, we used a white by Olympic, and the pulls, knobs and hinges are an oil rubbed bronze. The backsplash is subway tile grouted with white grout. I LOVE my new kitchen, and I LOVE Giani Granite! Their kit is SUPER affordable, and over a third LESS than other kits found at Lowe's and Home Depot! Their kits come with every thing you need to get the job done, and even includes a video! So give them a try, I promise you won't regret it! And the best part of this remodel? The cost is under $400!!!!! Do you love my new kitchen as much as I do?! Beautiful!!!!! Love the cabinets and counter top!! Looks great! I am so impressed you only spent $400?!? That is amazing! Making me want my kitchen re-done even more. The plan is to go white from our dark-stained look now. I wouldn't be able to do the "faux" granite because my asthma is sooo touchy (going out in our spring, pollen-filled air yesterday has me on oxygen today. So we'll be stuck with our fake, laminate butcherblock from the 70s or an entirely new top. I'm happy for you in you beautiful new kitchen. Such a change! Thank you for posting these pictures! Your kitchen looks amazing!!! I've been trying to convince my husband to use this product on our tile countertops. Now that he sees that it can be done and has been done we will be doing this to our kitchen counters!!! Nice job and the countertops definitely look fabulous! Beautiful remodel. The kitchen looks so nice and bright now. I love the countertop! Your floor is pretty cool too. Your kitchen looks fabulous, Janet! Wow! That's great! So many updates for so cheap! That transformation for less than $400?? I'd say you've got yourself a winner. Congratulations! How you must be enjoying your lovely new space! Just found your blog from Grace At Home. I'm so impressed by your makeover -- it looks like it cost a couple grand, not a couple hundred dollars. You've given me hope for my 20-year-old kitchen! that looks great with the white cabinets! i'm sure you can't stop staring at your new kitchen. seriously, i just hung some open shelving, and i keep going in there to gaze at them and their newly decorated ways. Wow, it looks fantastic, especially considering that budget! I bet you are loving it so much. Great job Janet! You did a fabulous job. It looks wonderful. Enjoy working in your new kitchen. GOR-GOUS! 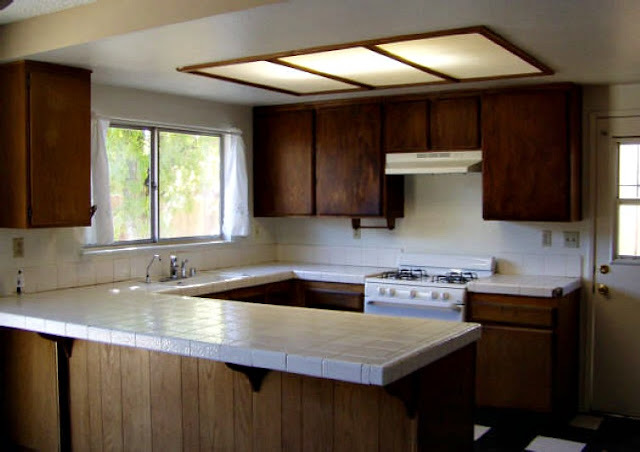 Love your kitchen transformation. I'm featuring it the PoPP Spotlight this weekend at Domestically Speaking. Thanks for linking up. Fabulous job - especially for $400!! It just looks so bright and cheery. I am still working up the effort to paint our kitchen cabinets. Thanks so much for linking up to The Creative Spark. I hope to see you again! Enjoy the rest of your weekend. Fabulous transformation! So bright and cheery! Thank you for linking up to Uncommon! Wow big difference and it looks great!!! Yours is the second use I've seen of this "granite" kit and it looks fabulous -- the first was a bathroom countertop refinished and also looked fabulous. I love your kitchen too; just happen to be partial to dark countertops and white cabinets myself :) And I love your floor - that is sooooooo cool! I will drop by again to see the reveal when you have the lighting redo finished. Absolutely gorgeous. You totally outdid yourself. The cabinets and countertop is gorgeous. Wow!!!!!!! This is such a wonderful post! I would love it if you would share this at our WIW linky party. Hope to see you there. My Goodness~ it is beautiful! I love it! Great job. It looks so much more inviting and happy now. Looks great! Now that you've been living with the new painted tile countertops for a while, how do you like the durability of the paint? That's my #1 concern with a project like this -- I don't think it would be that hard to make it look nice, but how would it wear? Kitchen counters (especially mine!) get used & abused probably worse than any other surface in the house, so whatever's done to them needs to be super durable. How do you rate yours? And does Giani granite sponsor you in any way? Thanks!